Treatment strategies for tibial hemimelia date as far back as 1877. The treatment of choice for TH has historically been biased towards amputation, though that does depend on the severity of the deformity. With complete absence of the tibia, amputation is recommended almost exclusively, while less severe deformities have several reports of limb salvage options. The presence of a tibia anlage, quadriceps muscles, and kneecap (patella) are important considerations for reconstruction. Imaging options such as magnetic resonance imaging (MRI) and ultrasound are used to determine the presence of the patella or tibia anlage. The most popular surgical treatment of tibial hemimelia was developed by Brown in 1965. He also recommended a Syme-type amputation of the foot. Unfortunately, studies do not seem to indicate good outcomes with the Brown procedure and most orthopedic surgeons recommend amputation rather than reconstruction as the best option for total absence of the tibia. Many of the poor outcomes were due to knee flexion contractures, knee instability, and poor range-of-motion (ROM). However, for some patients in which amputation is not an option, a limb that is weight-bearing though less functional may be considered a success. In less severe forms of TH, the treatment is not as clear as to the best course of action. The presence of a strong quadriceps, patella, and proximal tibia or anlage seems to favor reconstruction. Advances in the treatment of all types of TH offer new options with excellent functional results as an alternative to amputation. There have been multiple classification systems for TH proposed, including the Frantz and O’Rahilly classification, the Jones classification, the Kalamchi and Dawe classification, and the Weber classification. 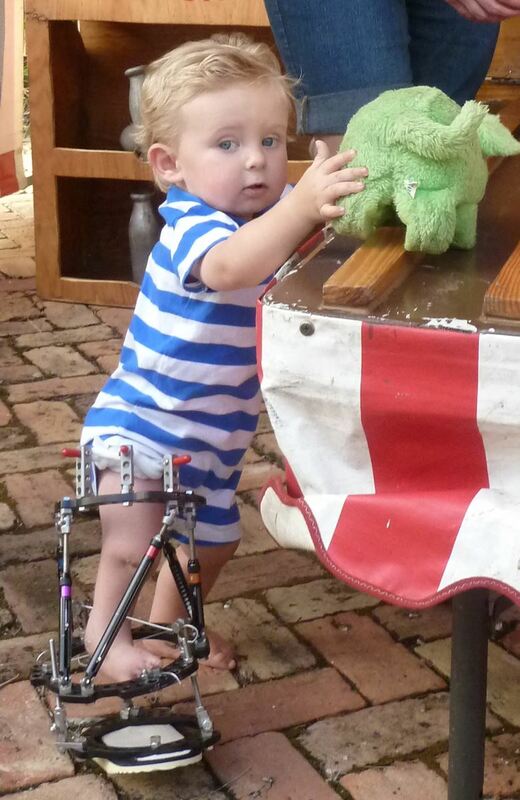 The rarity of tibial hemimelia lends itself to other variants that do not fit into classification schemes. These will require unique and specific treatment strategies. Dissatisfied with the existing classification systems, Dr. Paley developed a new classification system in 2003. Each classification type and subtype demands a different surgical treatment. The progression of deficiency is from least to greatest and is similar to the Jones classification but in reverse order. 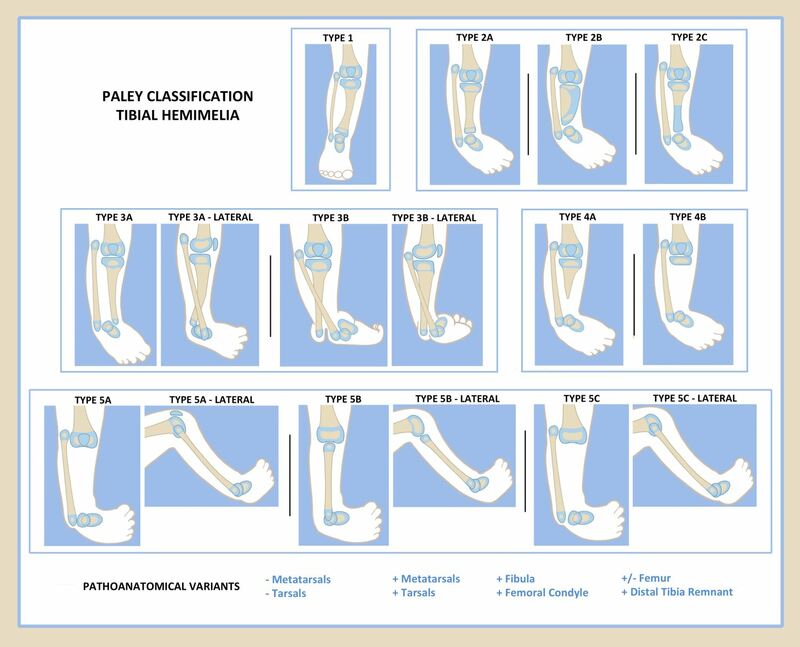 Furthermore, the Jones type 3 TH is so rare that Dr. Paley has never encountered it in over 27 years of practice and more than 300 cases of tibial hemimelia; it has been removed from the Paley classification, not only due to its rarity, but since it is a proximal (at the knee) instead of distal (at the ankle) deficiency and thus should be categorized as a congenital deficiency of the knee rather than tibial hemimelia. The Paley classification contains 5 primary types with multiple subtypes. Type 1 – Hypoplastic nondeficient tibia: valgus proximal tibia (genu valgum), relative overgrowth of proximal fibula, plafond present and normal. 2A - Well-formed distal tibial physis and separate from proximal tibial physis; tibial plafond present but dysplastic; relative overgrowth of proximal fibula. 2B - Delta tibia, proximal and distal growth plates connected through bracket epiphysis, malorientation of ankle and knee joints, ankle joint dysplastic, relative overgrowth of fibula. 2C - Delayed ossification (cartilagenous anlage) of part, or all, of the tibia, dysplastic ankle joint, distal tibial physis absent, relative overgrowth of fibula. Type 3 – Proximal tibia and knee joint present, medial malleolus present, distal tibial plafond absent, tibio-fibular diastasis present. 3A – Tibial plafond missing, medial and lateral malleolus present, varus diaphyseal bowing tibia, distal fibula (lateral malleolus) with foot internally rotated around tibia, talus may be positioned between the tibia and fibula due to absence of tibial plafond, relative fibular overgrowth. 3B – Same as 3A with skin cleft separating tibia and fibula, foot always follows the fibula. Type 4 – Distal tibial asplasia. 4A – Knee joint present, complete absence of distal tibia from level of diaphysis, pointed bone end often covered by separate skin pouch, relative overgrowth of fibula. 4B – Epiphysis of proximal tibia present but absent proximal physis, knee joint present, delayed ossification of epiphysis, relative overgrowth of fibula. Type 5 – Complete tibial aplasia. 5A – Complete absence of tibia, patella present; flexion contracture of knee, equino-varus contracture of dislocated foot and ankle. 5B – Complete absence of tibia, no patella present; flexion contracture of knee, auto-centralized fibula, quadriceps present, knee capsule present. 5C - Complete absence of tibia, no patella present; flexion contracture of knee, dislocated fibula, quadriceps absent, no knee capsule present. The Paley classification also adds a modifier to describe the presence or absence of associated deficiencies and duplications. This is listed as plus (+) or minus (-) signs for toes, metatarsals, tarsals or part or all of the femur, or as (+) for the fibula, distal tibial remnant or femoral condyle. The wide variety of deficiencies or duplications associated with tibial hemimelia can be easily desribed using the subtype system along with plus and minus indications. Through-knee amputation remains the most commonly recommended procedure for tibial hemimelia. Amputation is overused for Paley types 2, 3, and 4 TH. The reconstructive results for these types are very reliable and very functionally successful. For type 5A, where a patella is present, the results of a Weber patellar arthroplasty in the hands of experienced surgeons are also very satisfactory. The reconstructive options for TH have improved dramatically over the past two decades. With continued success and improvement, they may one day overtake amputation for good.